As a longtime sufferer of acne, I know what it’s like to feel self-conscious about how I look. I can’t even remember ever having clear skin. I’m envious of people who never have to deal with pimples and who have creamy, smooth and perfect complexions. My skin is far from that! I’m 35 years old and I still get breakouts like I did when I was a teenager. Keeping my skin clean and applying acne fighting skincare products does help, but it never seems to get rid of the issue for good. It’s a band-aid solution. I really truly believe that you need to treat the cause of acne from the inside of your body vs. the outside. There’s evidence that suggest that having the wrong type of estrogen plays a role in the acne breakouts. They are called toxic estrogens. I’ve always believed that hormones were one of the main causes of my acne breakouts. I always breakout right before and during my cycle. I’m not talking little whiteheads either. These are painful bumps called papules or as I like to say a “blind pimple”. The kind that never comes to a head and hurts like crazy. Many health practitioners also believe that androgens are one of the key causes of acne. They will often prescribe birth control pills to help control acne. Years ago, my doctor put me on a birth control pill that was also said to help with acne. I don’t take it anymore because of the side effects of being on the pill. Today I wanted to share with you some important information about toxic estrogens and their role in acne and a natural product that can help reduce their prevalence. Where do toxic estrogens come from? Hormone expert, Nick Delgado, PhD, ABAAHP, states that most acne is caused by toxic estrogen buildup. They are found in our food, plastics, pesticides, preservatives and household products. Our body also produces estrogen which can be overstimulated by a diet high in processed fat like dairy and meats. It’s recommended to eat more organic fruits and veggies and hormone-free dairy and beef products . What are the benefits of clearing toxic estrogens? Toxic estrogens reside in your fat cells and also attract water. You feel bloated and can’t seem to get rid of the extra weight no matter how much you diet and exercise. Once the estrogens are cleared from the cells, they can finally release the toxins and the water and shrink back to their regular size. Reducing estrogen intake in food and personal care products will also help too. Learning about toxic estrogen really made me consider if this could be what is happening to me. I struggled with losing the last 10 lbs and they would not budge no matter what I did. I’m beginning to think that toxic estrogen may be my issue…..
Are there any natural products that help to reduce toxic estrogens? The quick answer is yes, there is! 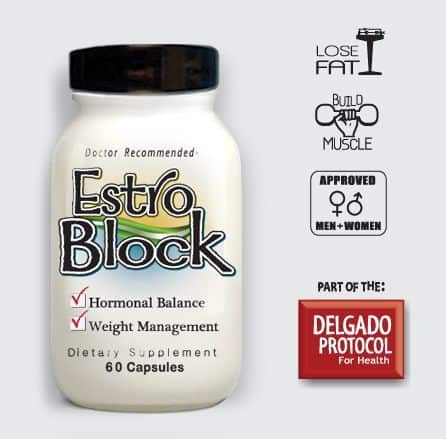 EstroBlock is a daily all-natural and plant based supplement that naturally supports the clearing of toxic estrogens from the body. It also helps to support the production of good estrogens. It works to clear your acne, balance your hormone and helps to get rid of belly fat. EstroBlock has been on the market for many years, but is not as widely known as other products. Many people believe its one of the best natural solutions for hormone related acne in both men and women. I was amazed at the results from the before and after photos. It’s like a night and day difference! In this post on BetweentheKids.com, it shows a before and after of 30 day use of EstroBlock and the results were impressive. There’s also a video review from a teen about his experience. Visit Delgado Protocol to learn more about EstroBlock and to purchase. They’ve also got a video where Dr. Nick Delgado speaks more about the supplement and its benefits. I also found EstroBlock on Amazon for $29 for 60 capsules! Connect with EstroBlock on Facebook. National Cupcake Day is Almost Here! Wonderful review with some very interesting facts. These past few months I’ve started to almost feel like a teen girl again with the breakouts. After reading this, I understand more why. Thank you. Wow this is awesome! I hate breakouts! Luckily I never had extremely bad acne, but I know people and relatives who did! Now that I know a great product I can recommend thsi! Thanks! Thanks for the shout-out. This really is a great product for anyone with acne issues! Totally works for my daughter and neighbor! Wow, I never knew there was anything out there that helped with acne like this product. Luckily I have never suffered from acne, except for the few years of being a teenager. I think this is a great option for those who suffer. Nice info. My Grandson is starting to get a lil bit of Acme so we may just have to give this a try and see if it works better than what we are already using! Acne is so disgusting. I need something that works. I have been having some really bad break-outs lately. I took the estro-block and it caused my period to NOT come. I stopped the pills and aunt flo arrived. I will say that it did make me less hungry, and I ate less. I will try it again after aunt flo. right now I am just using tea tree oil 2-3 times a day. WOW!!! This is just awesome. My son has really bad acne and nothing and I mean nothing has worked. We’ve tried everything from over the counter Clearasil to proactive. I am going to tell him about this. Thank you so much!!! I have occasional acne as does my husband. We aren’t big sufferers, but my niece has had horrible problems with it. I knew that you could make changes in your diet to help with the acne because she has had to, but I didn’t realize there were pills you could take, too. I like that they are natural and also help with water weight. I do now since sick. This sounds great let’s just hope I didn’t cause other lasting problems. This sounds like a great item to try for those have a lot of acne and breakouts. Have you tried EstroBLock and did it work on you? Thanks for the review! I have problems with breakouts when I was a teen and into my early adulthood. I was fine for awhile, except for the times when I was nearing my cycle (hello, hormones!). Now that I’m approaching 50 and in the perimenopause years, I’ve got problems all over again – hormones being the common factor. I’ll have to check into this. Good information! I’m having breakouts for the first time since I was teenager — I’m closing in on 50, and, like Kim, my skin is a victim of my fluxing hormones. I have been getting quite alot of acne now that I am in my thirties. This sounds like a great product. I am having breakouts now as I age when I did not get them at all when I was younger. This is nuts. Just came across this blog/post. Do you still take/use Estroblock? I actually have very bad cystic acne and 100% believe it is hormone related/chemical related. I have been to the dr. and they all say I am too young to have issues (I have a long list including night sweats, hair falling out, mood issues etc.) I just wanted to see if you were still an advocate of this product or what if anything else you have tried/recommend.